This epic culinary vision not only brings the farm to your table, it literally brings your table to the farm…or vineyard, beach, riverside, and any other picturesque spot the traveling caterers can find to host an unforgettable dining experience. An average of 130-200 guests dine together at each event and are served by both the traveling chefs as well as guest chefs handpicked from each destination. Jeff and Janet appreciate the idea of a large feast, period…this is probably the central-most theme of the Industrial Eats restaurant and menu. So imagining their culinary expertise being showcased in the middle of some of the most beautiful scenery around the world to a gathering of hungry life-appreciating foodies, they jumped at the opportunity. And now, several times over, they have been welcomed back and are quickly becoming an integral part of Outstanding in the Field. If it’s a windy day and/or it’s on the hot side, they will take the table to a cool sheltered canyon. If weather conditions are just right, still and sunny, they will put the table high up on the hill for an astounding view. Either way, count on great views as part of the farm tour. The service is also impeccable; the entire crew literally travels together to each event and participates in the setup, execution and breakdown. In both June 2017 and October 2018, Jeff was the guest chef at Beckmen Vineyards in Los Olivos. The fall before that, the crew from Industrial Eats cooked alongside the vines of Ampelos Cellars. The rural charm of these venues pairs perfectly with the lure that Jeff and Janet are now known for throughout the Valley. Menu specialties have included the infamous oyster-uni-avocado hors d’oeuvre, a staple on the Industrial Eats menu and one that often shows itself at private New West Catering events throughout the Central Coast. The family style feast will undoubtedly feature house-cured meats, locally sourced seasonal legumes fruits and vegetables. Platters…or better yet, mountains of food will continuously circulate the crowd in true feast form, and because the definition of feast is a large meal typically in celebration of something, the food will inspire diners to celebrate. Desserts of house-baked pastries with our signature “boozy” ice cream often bring the evening to a close…along with slow warm sunsets and desperate hopes of future gatherings just the same. The best part is that it’s safe to say just down the road Industrial Eats is accomplishing just that, minus all the Outstanding in the Field perfection. 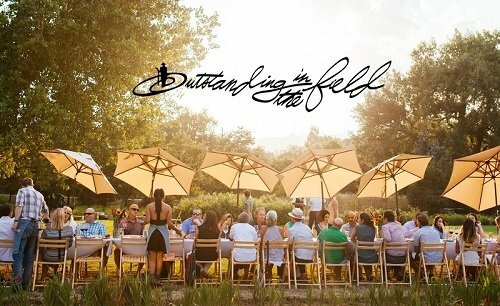 Visit Outstanding in the Field for more about where they travel and what delicious specialties they serve along the way, and keep a close eye on Central Coast dates, they sell out quick!